If you are looking for a pop of color that won't break the bank, then you just might love City Color's line of Dazzling Lipsticks. These lipsticks pack a punch with rich, creamy color that looks beautiful on its own or topped with a clear gloss for enhanced shine. Ready to see these beauties? Let's take a look. 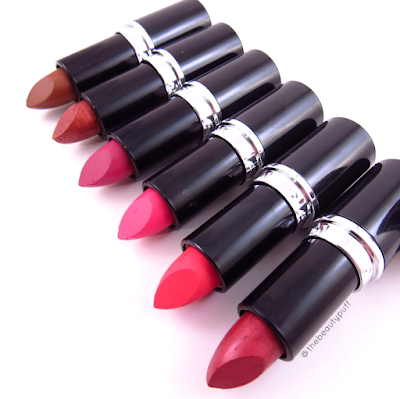 The formula of these lipsticks is really creamy and takes only one swipe to achieve full color. I haven't found a lip liner necessary but for a more polished, defined look you could definitely use one. There is really nothing "subtle" about any of these shades. I can't even say you could apply them lightly for a sheer effect because they are just pure, intense color! These are all great shades no matter which one you choose. I think Beso is my favorite of all the shades in this line. It's the perfect berry tone for fall. For summer, one of the brighter shades like Flamenco or Te Amo would be gorgeous! Salsa and Caliente have a bit of a metallic sheen, giving them a bit more dimension than the other shades. It isn't as noticeable in a swatch, but it really comes to life once they are applied. 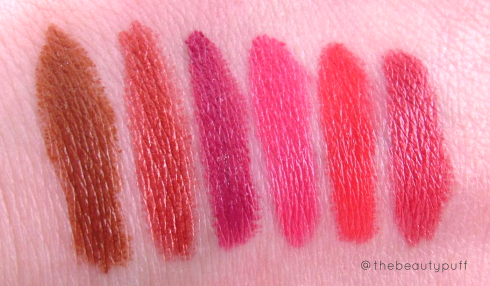 Each of these lipsticks feel smooth and lightweight, without any greasiness. You can also achieve a fantastic staining effect without washing out or wearing away the actual color. I applied Beso, let it sit for a little while, blotted and was still left with rich, intense pigmentation. This is a great option to reduce transfer of the product but still maintain the beautiful color.